I have begun to think of art mainly in terms of energy. More abstract and versatile than emotions (saying a piece is joyful or lamenting, etc. ), this lens has given me access to art, dance, and music. I also think of art forms as different realizations of this energy, and I love pairing them together because I think they strengthen their message when used appropriately. I like dance in particular because it moves in real time with the music, and makes me be specific with the energy of my movements and sound while still being abstract and universal. Fantasy for Solo Clarinet or Violin, based on the Gealic Folk song about a woman who loves a sailor but fears he will never return from his recent voyage. 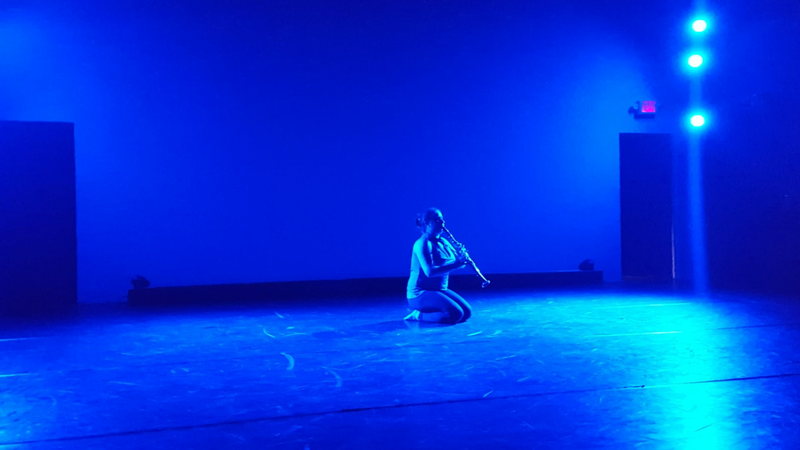 The idea for adding dance to the solo Fear A Bhata started because the piece is basically variations on a melody, each of which I feel explores loss in a different way with a different energy level. From the stillness of shock to the heaviness of resignation to the frantic energy of desperation to the simplicity and purity of sadness, so much of this piece was about energy. It seemed an obvious step to use dance to help explore and convey that energy. I think when two paired art forms complement each other appropriately, they can help the audience access a piece more readily–which is important because they usually only get one try. What I found in trying choreography though, was that linking dance to music gave me a whole new tool for finding my interpretation. 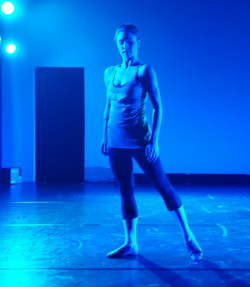 This blog shares what I learned about music through stepping into the world of dance, and how to begin using dance in your own practice–whether you want to actually move on stage or you just want to learn from another powerful artform in the practice room. As you will see in the videos below, I am not an experienced dancer, but I still found all these exercises helpful, and if I can do it, so can you. I don’t share any revolutionary exercises. These are all fairly common ideas in the world of theater and dance. But they aren’t in the world of music, and I think that needs to change. When I worked for my university’s fundraising department (we were the students who called you and asked for money), our motto was “smile while you dial.” You cannot convey excitement in your voice without showing it on your face and feeling it in your body. Try it. Just say something like, “hello,” and try to sound happy and genuine with a serious or unhappy look on your face. Then try it while smiling. How much easier was it to convey that emotion when you committed just that much of your body to it? In a concert performance I think we are a lot like voice actors. Those performers don’t sit there with their bodies perfectly still while emoting with only their voice. They plunge their whole bodies, entire beings into the character and the world. 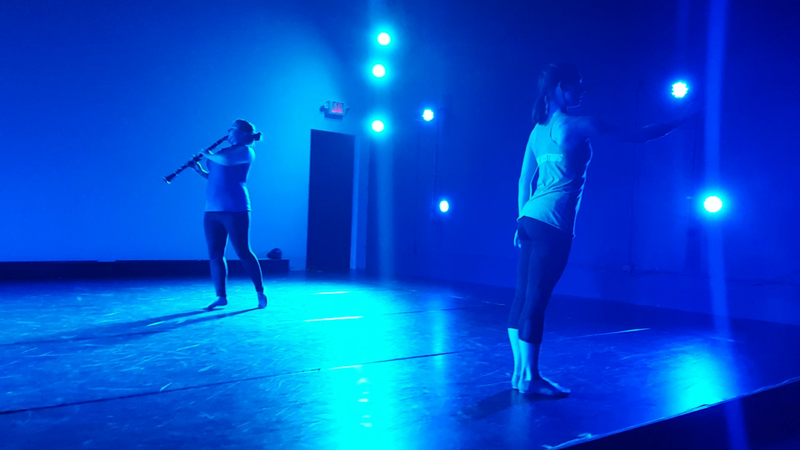 Now, it’s different than if they were live acting, and producing good technique with movement is a whole other issue, but whether we add physical motion to our performance or tone it down on stage, we need to be emotionally committed with everything we perform. Adding movement engages your whole body, letting you feel more fully what you want to convey. When you have to assign choreography to something you have to create, otherwise nothing will happen! Getting yourself into this curious and exploratory mode is so important in presenting a piece and when we work so hard at our instruments it can be hard to find that place again. It’s been said that practicing has three parts–conceptual, mechanical, and performance. This helps us first with part, finding what exactly we want to say with a piece that no one else has said. How does it do that? 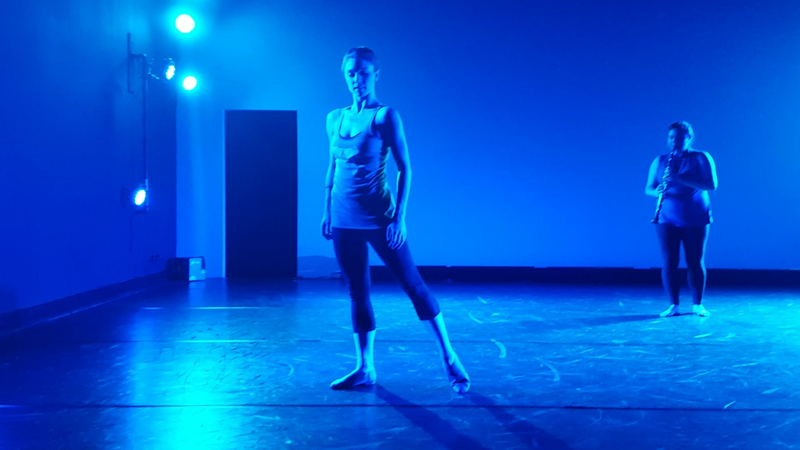 Dance has helped me be conscious about linking my emotion to my playing by embracing it with my full body and get myself into a creative mode as I explore a piece. But it has also made me more specific with my interpretation after I finish that exploration. We are always conveying something, even if it is not a literal story. We talk a lot about stories and adjectives and what we want to convey in our pieces. But dancing allows you to be specific both in the energy you want to convey and the precise moment in the music you are using to say it, without being too literal or limiting. I sometimes found that words or stories oversimplified the music and made the emotions or story feel mundane, limiting the abstract “universal” nature of music. And yet, it was vague with respect to the nuances of a phrase. We can’t have words for every note and for the connections between each note. We used words to explain what the music conveyed in trying to access what we want to say as artists because those were the tools we had with which to conceptualize it. But I think movement is a better tool. Example: Look at these releases. Even with no context, there are innumerable ways to release a note. These were just some of the first ones I thought of. We use words like “lift,” “pointed,” ect. But I often find that we are using words to evoke an energy, when movement is more accurate and easier to understand. Dancing helped me think about the types of musical decisions most good musicians already consider or naturally do, but made me be much more specific, accountable, and confident in my decisions. You can’t give every second a word description, but you can give it a movement. And you can make that movement relate to the movements of notes before and after just like you do with your instrument. And that movement can be just as abstract and emotive as the sound. Being accountable for motion at every second from start to finish makes me much more accountable for my interpretation. Is this the right movement for this note? Does it make sense in context? Why? For instance, look at these two versions of choreography, the high note is important in this phrase, but in what way? Which version of choreography expresses how you think this tiny section is phrased? How are they different? Both movements show tension and release, but which one is the exact tension you want to express? Which one relates to the notes before and after in the best way? Or maybe some other movement is more accurate of your interpretation. Working through this process gives me tangible clarity of my interpretation and confidence that I chose phrasing I can back up with reasoning that makes sense to me. 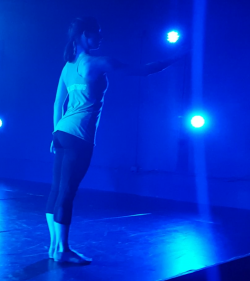 Having a motion gives you a physical, experiential manifestation of the energy you want to convey, and when you are ready to perform, you call on this more tangible and recallable representation when you think of the emotion and energy you want to convey with the line. It’s still important to recall the sound before you play, but good tone is different than good phrasing, and having a motion and a sound to recall helps me imagine both. I can think about how it feels to play technically correct as well as how it feels to move with that energy so that I am imagining technique and musicality. Dance also made me more aware of my whole body and everything I have at my disposal as a performer. We are so focused on our sound, we forget that people usually watch us when we perform. I can hear that dance helps me find my interpretation, but it also happens to give me a stronger stage presence by reminding me that my whole body is part of the performance. Whether I actually move during performance or just use it as a practice tool to refine my interpretation, committing with my whole body–eye contact, breathing, posture and stance–not only creates helps me find the right mood for my own playing, but provides a better atmosphere for the audience. The rest of this post is designed to help people experiment with adding in movement to some of their practice. Feel free to skim or come back to this post at a time when it may be more beneficial (I assume half of you are waiting in line somewhere–that’s where I do a lot of my best reading). There exercises provided generally have two purposes. Half of the goal is to experiment with how your body can move. 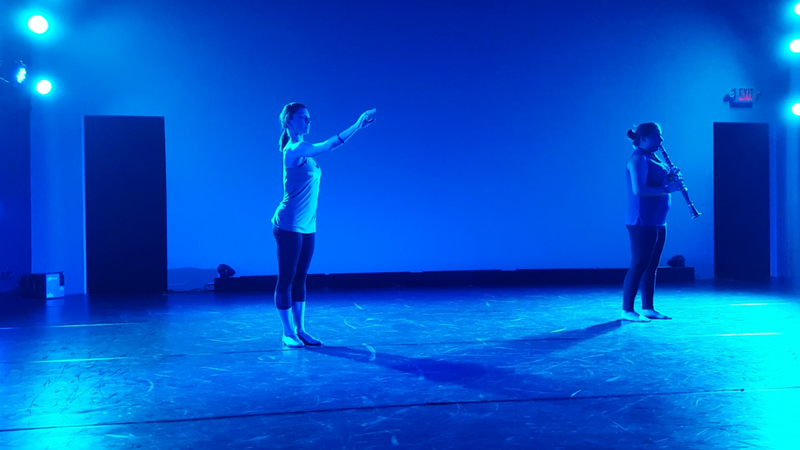 I once heard choreographer John Heginbotham say that dancers don’t have anything special–they have the same four limbs everyone else does, and dancing is just a puzzle to find wonderful new ways to use them. This was something that had literally never occurred to me and I thought it was magical. Most musicians (me included), are a bit stiffer with their bodies, and less practiced with this puzzle than your average theater or dance student. We need to get used to all the possible ways to move our body that we don’t use in daily life if we want to play with movement. Another goal of the exercises is to practice using those movements with a specific emotional intention. We can tell young students when to crescendo, when to play loud, etc. But the dynamic is really just an element of our interpretation. This is the difference between long tones where you practice crescendos and decrescendos, and attaching emotional meaning to the dynamics in a piece. You can lift your arm or leg or move or hold still, or anything. The actual choreography is less important than the intention behind it and how it relates to the choreography around it. We need to practice figuring out how to express whatever emotion or concept we imagine. Give yourself a completely judgement-free zone. For me, this is ideally a large, locked room with a mirror where I can see me but no one else can. (We don’t always have this luxury, but get as close as you can. Schools, churches, community centers and more are often friendly and living rooms are bigger when the furniture is moved to the side.) This is the chance to badly dance while no one is watching and look really dumb and enjoy laughing at yourself. And then surprise yourself when you do something awesome. This should absolutely be fun and enjoyable. If it is not, change anything you need to so that it is. Experiment with different ways to stand and fall to the ground. The dancer who suggested this came from the Limon school, which describes movement (I say very generally and not-expertly) as succumbing to gravity or fighting against it. First spend a few minutes finding variations of ways to find yourself on the ground in various poses and ways to get yourself standing again. Lead with different body parts (hand, knee, head, etc. ), experiment with different speeds up and down. Do the same exercise as above, but start attaching an adjective or feeling to it. Imagine feeling forced or weighed down and struggling to get up. Then switch it and float down and feel like you’re being lifted up. Now move as though everything is heavy, liquid, airy, sticky, or anything else you imagine. I used the up and down motion as a loose framework for this just to have something to guide me, but you can do this as a totally separate exercise where you may not end up on the floor but rather moving through space. Do a movement adding a new prompt to the motion. Move taking up as much space as possible, as little space as possible. Move with your knee leading everything, or your elbow. Move thinking about circles, now thinking about angles. As with most of these exercises, there is no wrong way, idea, or movement. Just stay with each prompt for a while, giving yourself time to experiment. The goal is to get you thinking creatively about how to use the tool of your body. Imagine you are throwing energy back and forth (or in a circle if you have fun and cool friends who will try this with you). Start by just throwing energy around and trying to match the way the person throws it to you. Was it fast? Did it seem like they were throwing something heavy? Was it aggressive? Gentle? Every couple rounds someone can randomly change or alter the energy for a while and throw it in a new way. The important thing about this is to make sure you commit with your whole body to what you think the energy is. This gets me thinking about all the different ways energy can look and feel in the abstract sense of visualizing energy. I used this to practice drawing from the sound I was hearing rather than abstract thought or made-up emotion, without limiting me to the piece I was working on. Don’t worry, you’ve been improvising dance ths whole time. Now you are just doing it with music. And, it is really fun. Put a piece of music that you love on repeat–a pop song, jazz song, classical song, or anything that inspires you that day. I liked pop songs because they have fairly clear sections that repeat and are pretty short. 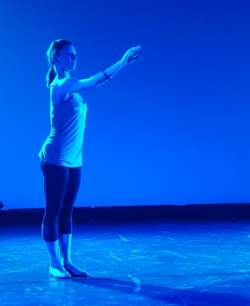 Play with improvised movements without worrying too much about what the product is. The only goal is to let your body experiment with possibilities that match the sound you hear and at this stage it is much more important that a movement feels like the way the music makes you feel rather than that it looks good or that it conveys that feeling appropriately. It’s okay to take a few seconds to regroup every now and then, but try to keep moving without judging if something doesn’t work. Eventually, something will get close to expressing what you want to express. Dance helped me be attentive to every note in my phrase and to be very exact, purposeful, and confident in my phrasing. Most of us have had a teacher ask us what the high point in a phrase is. That is on the right track, but much less detailed, and much less helpful. Below I walk through my thought processes in exploring movement with pieces. This is for people who are ready to apply it to a specific line of music. Below is an example from Fear a Bhata (the contemporary piece above) and then from the very standard Mozart clarinet concerto. This is from Fear a Bhata above, so we know it is generally a sad. It is also fairly easy to see there are basically two peaks here. The composer pretty much gave that to us with dynamics. But now let’s be more specific in how we interpret it. Play or sing it a couple times in a comfortable key for you. Now think about the energy of each note and the overall phrase. You can start choreography anywhere that speaks to you, and for me that is the first note. I think it begins fairly still and grows. But let’s define our stillness. Are you absolutely still like suspended animation or is more like slow motion? Is your slow motion a struggle against heaviness, tired, cautious, or gentle exploration? The first note is over 2 beats–do you want to reflect that or is it really one elongated beat? Do you have a gentle movement like an inhale or exhale? Or maybe a gentle sighing downard feel? Play with moving and holding your body in a way that reflects the energy you want to convey. The size and speed of your motion will reflect the sound you want. Even better, can you position your body in a way that fits the character? Are you lying on the ground? Standing? Kneeling? What about your head and gaze? Are you looking at the ground? Or out in the distance? Where in the music will your gaze change? There are tons of answers that can work, and more important than what the movement is, is the way it is done and the relationship between that movement and the ones around it. Look how powerful Lauren’s’ pose is here. Her face and energy are more important than the position–that is where her power and energy come from. The actual pose matters most in its relation to the poses before and after it–that the movement and energy changes parallel the music. As the phrase grows with the next three quarter notes, how much does the energy change? Enough that your pose changes? Is it steady growth? Where does your gaze go? Does each note warrant it’s own motion? If so, do they 3 different motions, or 1 motion repeated 3 times? Or are they part of one larger motion? How does this stillness compare literally and physically to the first note? These are tough and exhausting questions to consider, but hopefully also fun and rewarding. The stillness that I chose is what I draw from in the silence before this measure. Now we are (finally! haha) in the second bar, where our first climax is. What kind of arrival point is it? How can you move your body so that it feels the way that should sound? How do you come out of it? At the end of those three notes are you in the same sad place or a different one, emotionally. And then how can your choreography reflect that? For me, I end up back in the basically same lost state of shock at the end of the bar that I started in, trying to pull myself up and out of it, but crashing as I failed, still in shock. And my pose reflected that interpretation. As the phrase grows with the crescendo how much energy are you really conveying? Enough to take a step? Several steps across several notes? To move across the floor? To stand up or fall down? Look at the slur markings. How does your movement reflect that phrasing while recognizing the changing notes and faster energy? Should you take a step for each note? Or a motion that changes when you rearticulate? We can track the growth of the rest of this phrase using Chelsea’s dynamics and see that it slowly builds until ff. But again, let’s be more specific. Does it grow at a steady rate? How do you transition from the stillness of the B to more energy without overdoing it? This is clearly a long a slow process, but these are the types of questions we should always be considering. Adding the layer of movement gives us another avenue to explore our artistic interpretation. In performance, I was on the floor for this section because I liked the falling and standing before and after. As with our musical interpretation, our physical interpretation can constantly change and adapt as you move through the line and develop a better concept of the overall piece. The same way you may need to start a phrase softer to build a better crescendo, you may need to adapt a beginning pose to fit the movements that you choose later, and that’s great! This is exactly the right process. Experiment with different movement until you find one that feels like what you want people to feel when you play. I also find this activity helpful for re-accessing pieces I have had for a long time. The Mozart clarinet concerto is the most standard piece in clarinet repertoire and it can be hard to keep those pieces fresh. I like taking small sections and rejuvenating my interpretation with these exercises. Adding movement works well for me in pieces I know really well already anyway. After listening to and playing through it a few times, the first thing that spoke to me was the F in measure 5. I think it should have a little more emphasis to it, and decided a lifting feeling was what I wanted to convey. There are many ways to emphasize a note, and I narrowed it down to a lifting feeling. Let’s clarify that by experimenting with different ways to feel that energy. Try it. Shown below, I arrived at lifting my leg (one of many options). My leg can lift straight up or bent. Do I want to turn slightly while lifting? Or just lift in place? What is the difference between those interpretations? This is a mini climax in my choreography and in my musical phrase. Now what about the rest of my body. Where is your gaze? I found mine gently up as a way of expressing joy I wanted to express. Next I thought about releases. There are quite a few in these opening measures and it can be difficult to make them sound clean and appropriate for the style. So rather than thinking about technique, think about phrasing. After experimenting I found I like to leave the last note with my leg in motion that gently slows. I wanted to continue the energy of the line to the accompanying orchestra rather than finish it separately like my own sentence with a simple light step on beat one. Now contrast this release (8) to the release in measure 4. How do the releases differ? How does the difference come across in your movement? I interpreted this as a mini ending, closure for the tension earlier in the phrase (maybe you don’t). Look at the difference in movements between these. I went to the opening to help give me some context for that movement. The simplicity in classical pieces is what makes them difficult and this opening has always been a good example for me. I found choreography that reminding me of bowing. This is the introduction where my innocent character happily greets the audience and humbly bows. The bow here helped me make the E slightly smaller than the opening G while still keeping the energy of the line building, just as your energy builds when you rise up from a bow. This is me (really in a practice session) experimenting with variations and improvisations on that bow. It’s not just bowing though, it’s greeting the audience with my gaze, feeling like I am smiling, having an open and inviting posture with my upper body. Then gently bending to excitedly push up from the bow. This is the energy I want to experience so that I can channel into my playing. It was through this that I found the release that I liked here (with my leg bent in the air). I like the way it interacts with the energy of the rest. Once I clarify my bow, that is likely where I will devote my time. When I go back to playing without movement, I still call on this feeling before I play the first note and as I continue the phrase. This is still in the works, but this where I am currently in using movement for phrasing with this piece. I have been and will continue working through this piece, dealing with one note or note group at a time. This also took several sessions of experimenting with movement, and it is important to balance dealing with small sections of music at a time while being patient and giving yourself a chance to be inspired. Do not create a motion that does not match your interpretation. This is a very long process, but don’t be impatient, rushed, or stressed. Like the exercises above, it is important to keep yourself in a playful, judgement-free, exploratory mode to get the most out of this. It’s a slow process and involving our full body can be a scary new experience, but also very fun and rewarding. It is at least as much about getting yourself to experiment as it is to actually find a good movement. Let me know what you think, what was useful, any advice you have, or any questions. If you want to learn more, I recommend taking some improvisation classes (and I don’t mean musical improv) or other art and performing art classes that get you used to being in the present, reacting to your environment, and using your full body. But most of all, reach out to any aquaintances you have in other arts fields. We all have so many talented friends with so much to share. This post and project would not have been possible without the help, advice, and encouragment of so many friends from other fields who so freely gave of their time and expertise. Don’t lose out on that from the people you know–even if they currently just Facebook friends and not your best friends (yet). To Marshall Ellis, Lauren Sherwood and ME Theater dancers for welcoming me into their world with open hearts and ears. To composer Chelsea Komschlies for her support and enthusiasm. To everyone who read this article or encouraged the sharing of information between artists. 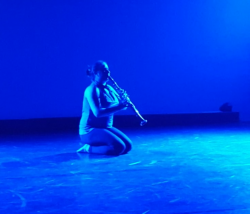 Jessica is a classically-trained clarinetist based out of Florida who loves cats (both house cats and Wildcats), vegan chocolate chip cookies, psychology, and working with as many different types of artists as possible.